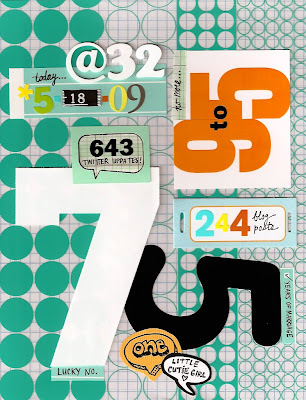 Just in time for the 3-2 yesterday, we posted a challenge at the Creative Type that's all about numbers. Which is the perfect opportunity to record an infinite amount of random facts about your life as it is right now. 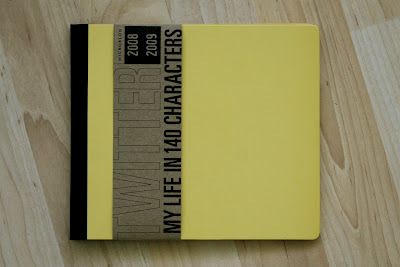 (Yeah, 643 Twitter updates, 244 blog posts? Woah. I can't even tell you when I became that kind of girl. And I didn't even get into my Tumblr stats.) I dare you to play along – you have two weeks to make a page using lots of numbers and link it up here. Go forth. Also, speaking of Twitter. I am currently taking CZ's microblogging class. It's basically perfect for me. I love to embrace the inner monologue. 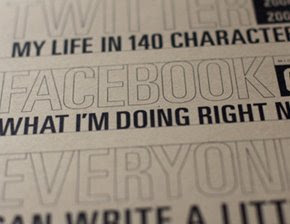 You scrapbook your Twitter updates. To describe it in 140 characters or less, it's genius. Belated happy birthday, Jen! What digit b'day was that? happy birthday! love the LO...so tempted to take that class cos i keep seeing such awesome things! i love LOVE love the number facts idea jen! esp on your birthday. it's perfect. so good it's been rolling around my brain for the last few days: 694 emails, 9 skype contacts, 3 unheard voicemails... makes me want to ditch work and company and just play. thanks for the inspo! Well that's just effin brilliant! I'm going to do both of those... The page and the twitter mini!